The end product was an understated, slim card-backed booklet containing 35 black and white photographs and a relatively brief, but thoroughly researched, treatise on the history of the village and its status in the late 1960s. It is written in Olive Cook’s eloquent, somewhat florid but always enjoyable, academic style. The booklet is very rare, and I only discovered its existence by chance several years ago when a web search for work by Edwin Smith picked up a copy for sale in the USA. I managed to purchase it and it turned out to be a fascinating find. 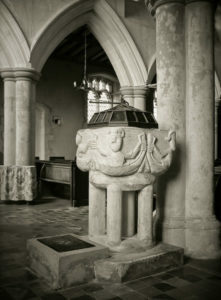 The Norman font in Anstey Church, showing the mermen carvings. Photograph by Edwin Smith. Of the several photographs included, none have ever been published anywhere else. Many were in Edwin Smith’s established architectural and landscape style but others exhibited rare examples of a more social documentary approach. Of the classic architectural views, one of the interior of the parish church particularly interested me. 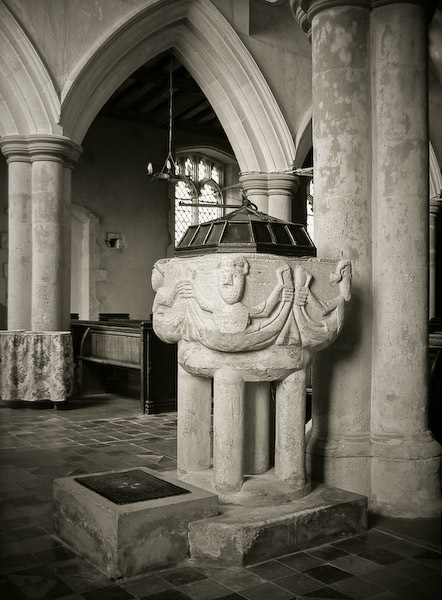 It showed the unusual design of the font; a square Norman bowl on a squat, four column plinth, with four mermen carved at each corner, each holding their twin tails to make an encircling garland. I had seen this unusual design only once before. When I lived in Cambridge in the 1970s, I remember visiting the tiny church of St Peter on Castle Hill, near to the Folk Museum and Kettles Yard gallery. It too has a font featuring carvings of mermen, which is dated as being 12th century. Turns out that the Cambridge example is the only other in this style in UK, a mere 19 miles away from Anstey. 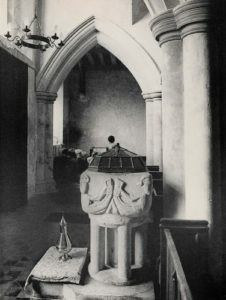 A view of the font at St George’s, Anstey in 2003. Photograph by Roy Hammans. The origins and significance of this unique design are unknown. 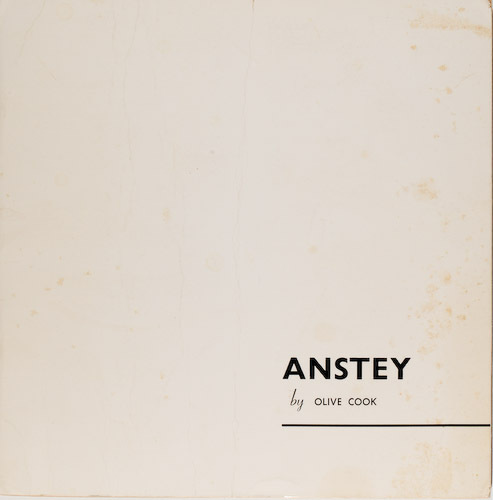 I was sufficently intrigued by this booklet on Anstey – and the unusual font – to make a trip out into deepest Hertfordshire in 2003 to see it for myself. For reasons I can’t recall, I only seem to have taken a small and primitive digital camera with me on that trip. Nevertheless, I did manage to get a photograph of the unusual font that I think stands well beside the Edwin Smith version. I’ve approached from a slightly different angle, which to my mind shows off the motif more effectively, and of course there is a different light – although it still has that unique quality that one only seems to find inside English village churches. Thirty five years separate these photographs; the church of St George at Anstey has stood there since before the 13th century. Looking at some of the other photographs of the village, both by Edwin Smith and others, I think it deserves another visit someday. 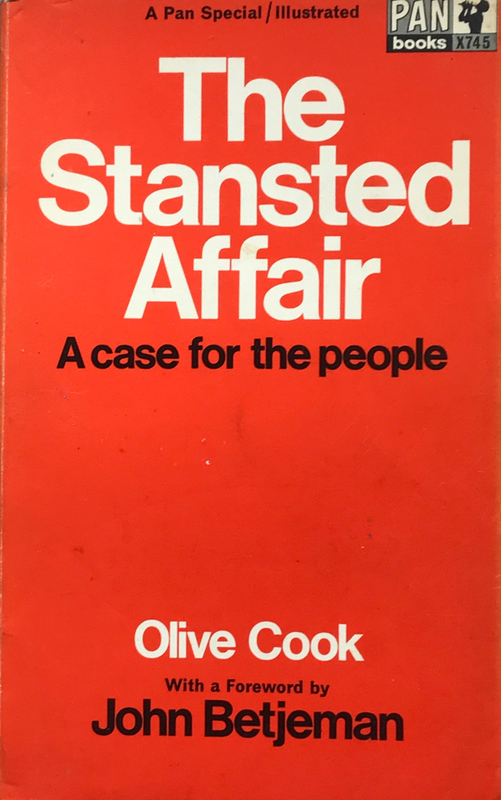 Olive Cook’s book in opposition to the whole Stansted Airport proposal was published by Pan books in 1967, with a foreword by John Betjeman. The book contains eight of Edwin’s photographs illustrating some of the buildings and landscapes that would be affected by the plans.